A chart of the West Indies, from the latest marine journals and surveys. Der Warme Meeresstrom Des Atlantischen. Facsimile: Part of America by Gussefeldt. 1 : 36000000 Gussefeldt, F.L. The Western Ilands / by Rt. Morden. from Geography rectified, or, A description of the world : in all its kingdoms, provinces, countries, islands, cities, towns, seas, rivers, bayes, capes, ports : their antient and present names, inhabitants, situations, histories, customs, governments, &c. : as also their commodities, coins, weights, and measures, compared with those at London : illustrated with above sixty new maps : the whole work performed according to the more accurate discoveries of modern authors / by Robert Morden. Tabula geographica Mexicæ et Floridæ &c.
4. Atlas des ganzen Erdkreises. 1 : 60000000 Reichard, C. G.
Birds eye view of the city of San Francisco. Messico, ouvero Nuova-Spagna : che contiene il Nuovo Messico, la California con una parte de paesi adjacenti / G. Pitteri scr. The unique map of California. Pascaerte van Westindien : de vaste kusten en de Eylanden. from De zee-atlas, ofte, Water-weereld : waer in vertoont werden alle de zee-kusten van het bekende des aerd-bodems : seer dienstigh voor alle heeren en kooplieden, als oock voor alle schippers en stuurlieden / gesneden, gedruckt en uytgegeven t'Amsteldam. New Map Of The Union. Map of the United States of America, the British provinces, Mexico, the West Indies and Central America, with part of New Granada and Venezuela / map drawn by Geo. W. Colton ; engraved by John M. Atwood ; border desig'd. &amp; eng'd. by W. S. Barnard. Pascaerte vande Vlaemsche, Soute, en Caribesche Eylanden, als mede Terra Nova, en de custen van Nova Francia, Nova Anglia, Nieu Nederlandt, Venezuela, Nueva Andalusia, Guiana en een gedeelte van Brazil. Pascaerte van Nova Hispania, Chili, Peru, en Gvatimala. from De zee-atlas ofte water-wereld : waer in vertoont werden alle de zee-kusten van het bekende des aerd-bodems : seer dienstigh voor alle heeren en kooplieden, als oock voor alle schippers en stuurlieden / by Pieter Goos. Amérique Septentrionale publiée sous les auspices de Monseigneur le Duc d'Orleans prémier prince du sang / par le Sr. D'Anville. 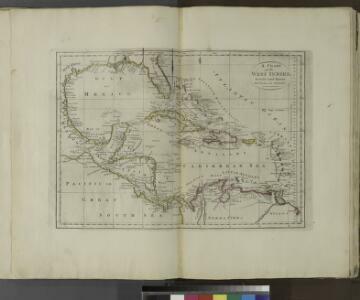 Description: from Carey's general atlas, improved and enlarged : being a collection of maps of the world and quarters, their principal empires, kingdoms, &c.